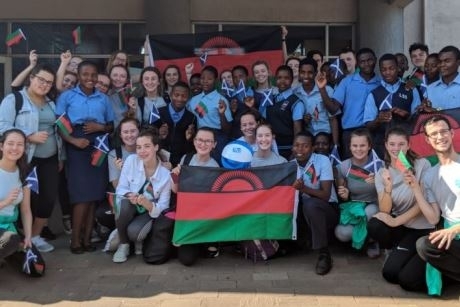 The school took off to Malawi in September 2018, in support of the Scotland Malawi Partnership which aims to foster further links between both countries. It was on this trip that the school won over the STA Travel Education Team to become the winners of the £10,000 to be spent on a trip of a lifetime. In order to enter, schools were required to book a trip with the STA Travel Education team, after which group leaders were sent a pre-departure pack containing a beach ball. They were then asked to feature the ball in a creative photo of the group entering, and to share the image on social media. Speaking of the competition, Ellen Rayner, director of STA Travel, said: “No funny business, we’re just passionate about inspiring the next generation. Travel educates as well as inspires and we want to make school trips a more realistic opportunity for many students. Outside the Classroom (LOtC) badge for its efforts in encouraging students to go beyond the classroom. Offering a range of subject-based trips with links to History, Business, ICT and Sports, among others, STA Travel Education offers a variety of trips abroad that can be used to cater to a number of learning objectives. For more information on booking an educational trip with STA Travel Education, visit https://grouptravel.statravel.co.uk/school-tours-see-all.htm. Top destinations that teachers should have on their radar for 2019 as suggested by STA Travel.